Journal photo by Emily Williams. A contentious debate over a proposed development on Overton Road is expected to continue into December meetings of both the Mountain Brook and Vestavia Hills city councils. Developer Ron Durham is requesting the rezoning of properties along Fairhaven Lane in Mountain Brook and Poe Street in Vestavia Hills so that he can construct a 41-unit condominium development there. Two-thirds of the property is in Mountain Brook; the rest is in Vestavia. The group’s petition against the development also cites objections to the development’s size. Instead, the group suggests it would approve of single-family homes being placed on the property. Developers have argued that the impact on the area’s traffic would be minimal. Skipper Consulting, a traffic engineering company hired by Durham, has said that the condos would add only 25 total trips to the morning rush hour and 30 total trips to the afternoon rush hour, AL.com reported. Durham added that the condos were primarily for “empty nesters” who wouldn’t add significantly to traffic. Opponents to the development dispute that number, with some saying it could bring as many as 200 more cars per day, and argue that the roads are far too narrow to accommodate any increase. The development, Stop Overton Traffic argues, could cause subsequent safety problems for surrounding neighborhoods. 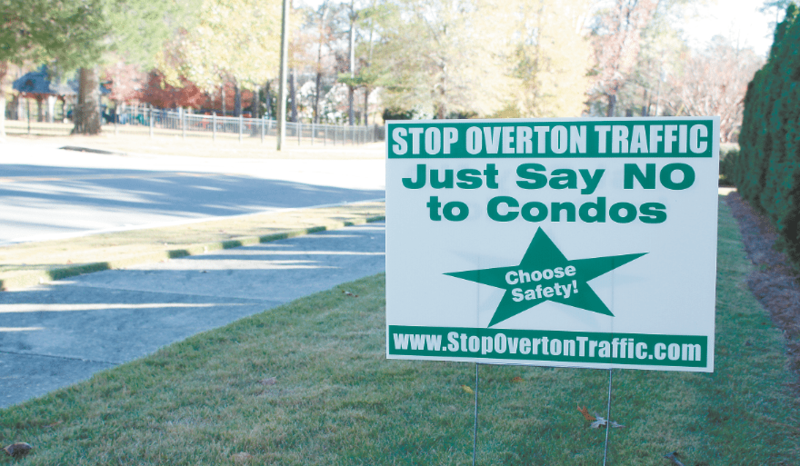 “What are now quiet residential streets will likely become common cut-through streets as we all try to avoid the ‘mess on Overton,’” the coalition’s website states. The Mountain Brook City Council held a public hearing on the proposed development on Nov. 13, and public response was so strong that the council delayed its vote on rezoning, electing instead to continue the public hearing during its Dec. 11 meeting. The Vestavia Hills City Council is slated to have a public hearing on the development during its Nov. 27 meeting.